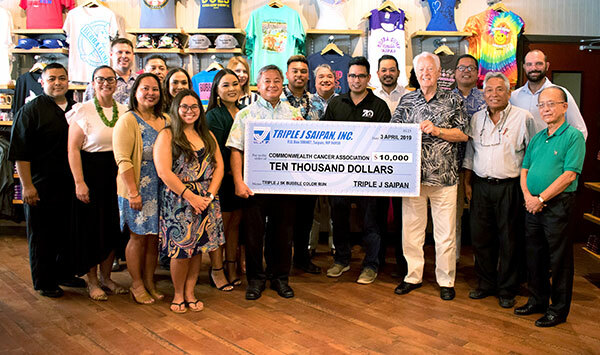 Triple J Saipan Inc. has donated the proceeds of its 2nd Annual Family Bubble Color Fun Run/Walk to two beneficiaries: the Commonwealth Cancer Association and the Make-A-Wish Foundation Guam/CNMI Chapter. 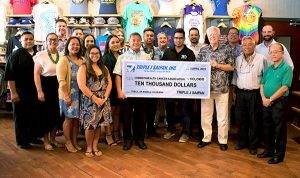 Triple J officials handed two checks totaling $20,000 yesterday to CCA executive director Juan Babauta and Make-A-Wish Foundation board member Kanae Quinn. Each organization got $10,000 each. Babauta said the money would go to the upcoming Marianas March Against Cancer. 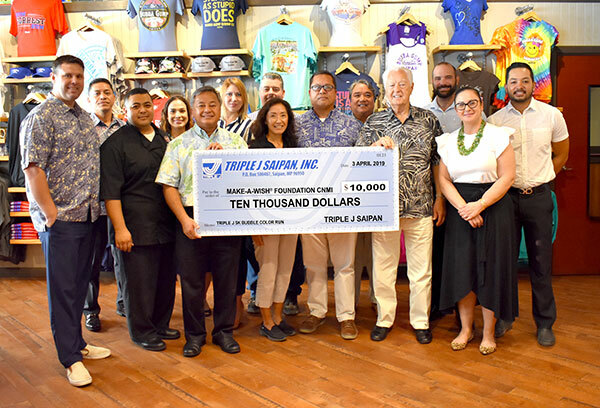 “On behalf of the Commonwealth Cancer Association and the March Against Cancer board of directors, we are greatly appreciative of the generous donation from Triple J Saipan. The proceeds donated will help those who bear the burden of battling cancer and cancer-related illnesses and help fund awareness and prevention programs within our communities,” he said. 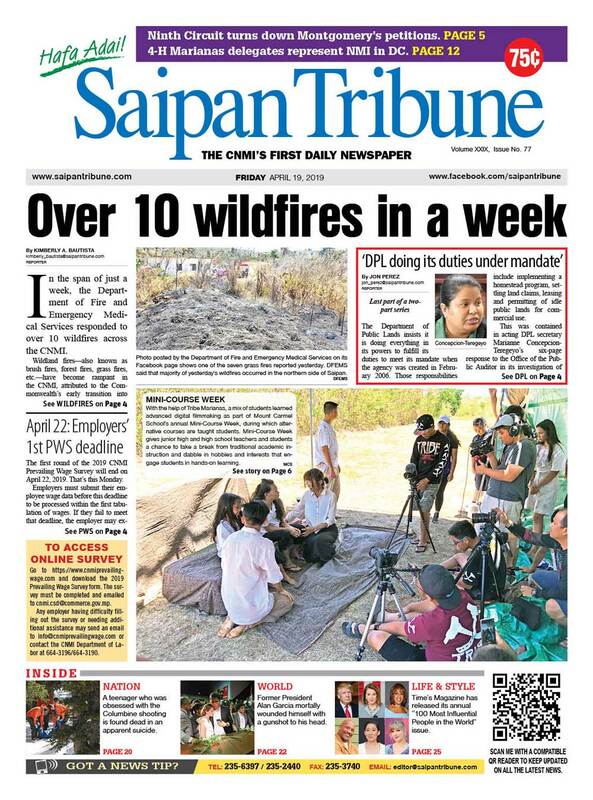 MMAC board member Bobby Cruz added that, although there was every excuse to cancel the March, including ongoing recovery from Super Typhoon Yutu, donations from sponsors like Triple J is making it possible to move forward with the event. 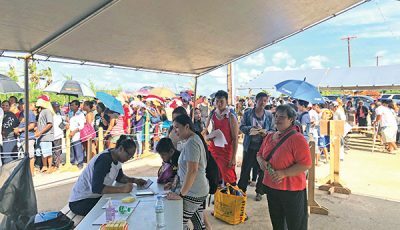 “Despite the strife and struggle Super Typhoon Yutu caused, you guys are giving us the opportunity to keep the fight against cancer going,” he said. Check holders Mike Sablan, left, Triple J Enterprises Inc.; Kanae Quinn, Make-A-Wish Foundation board member; Jay Santos, Make-A-Wish Foundation board member and general manager of Triple J Five Star Wholesale and Truckload Store; and Robert H. Jones, chairman of the Board, Triple J Enterprises, Inc. are joined by Triple J’s executive team. Quinn said the foundation is currently working on granting the wish of a child who attends Hopwood Middle School and Triple J’s donation would go toward making his wish come true. The 2nd Annual Triple J Family Bubble Color Fun Run/Walk was held last March 3 and had over 1,200 runners. 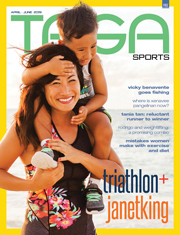 Maria Valentina Haberman, Triple J Saipan marketing manager, said they have partnered with Chacha Ocean View Middle School—as the Triple J Lancherus—to raise funds for March Against Cancer fundraiser. “The Triple J Restaurant Group [composed] of the Surf Club Saipan Restaurant, Capricciosa, and Tony Roma’s offer $1 of every iced tea purchase, Bubba Gump Shrimp Co. offers $1 from every Strawberry Speckled Lemonade purchase, and Triple J Motors will donate $25 from every new car purchase to the CCA. 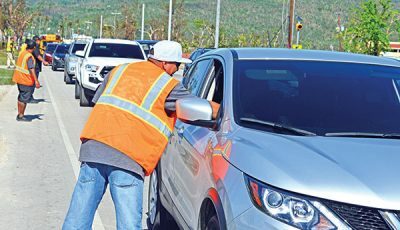 We encourage the community to join our Triple J Lancherus team and support the Commonwealth Cancer Association through MMAC 2019,” she said.